Please check-in at the Ticket Kiosk 20 Minutes prior to the Departure Time. Show your iVenture Card at the Ticket Kiosk for redemption on the day you decide to do the tour (pre-booking is not possible with iVenture Cards). Sightseeing Cruises operate everyday of the year. Departure Times change daily and are subject to change without notice due to tides, weather conditions, river closures and major event days. Melbourne River Cruises has been showcasing the city and its important Yarra river landmarks to locals and visitors alike for over 30 years. Cruise past Melbourne’s major attractions including the Botanical Gardens, the Melbourne Cricket Ground and sporting precinct, Federation Square, Southbank, Docklands and also further to Williamstown. 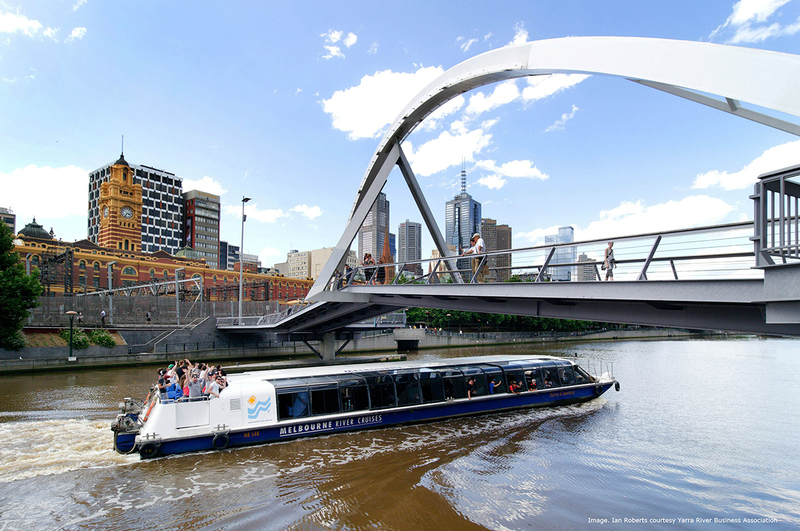 Enjoy a 1-hour cruise on the Yarra River. Your iVenture Card allows you to choose from two cruises. The 'River Gardens' takes you from Melbourne’s cultural Arts precinct through the stunning gardens and parklands of Melbourne. The 'Port & Docklands' cruise travels around the busy trading area to see sights like the 19th Century sailing ship “Polly Woodside”. As you view the City from this unique river perspective, you will see why Melbourne is one of the “Most Liveable Cities in the World”. ˄ Intermittent Cruise Timetable: Does not always run and is subject to tidal & weather conditions & demand. Make sure you arrive 20 minutes prior to the Departure Time in order to check-in at the Ticket Kiosk.